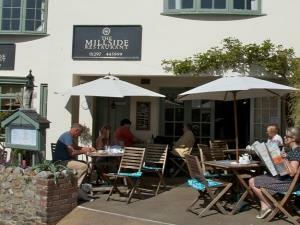 The Millside Restaurant01297 445999work RestaurantWith the sights and sounds of the river Lym and the Town Mill just outside it makes for the perfect setting to relax from the hustle and bustle of the town centre. The rejuvenated town mill has become one of the most vibrant areas of the town with art galleries, artisan foods, drinks and of course The Millside Restaurant. With the sights and sounds of the river Lym and the Town Mill just outside it makes for the perfect setting to relax from the hustle and bustle of the town centre. The rejuvenated town mill has become one of the most vibrant areas of the town with art galleries, artisan foods, drinks and of course The Millside Restaurant. THE RESTAURANT WILL BE CLOSED SUNDAY NIGHT, MONDAY, TUESDAY AND WEDNESDAY DURING NOVEMBER.